The 2010 Constitution (as amended) is the basis for Niger's Seventh Republic. It stipulates that all Nigeriens are born free and equal in rights and that the human person is sacred. "The State has the absolute obligation to respect it and to protect it."Arts. 10 and 11, 2010 Constitution (as amended).Everyone has the right to life, health, and physical and mental integrity.Art. 12, 2010 Constitution (as amended).The rights of every person to freedom and security "in the conditions defined by the law" and to freedom from torture and other forms of cruel, inhuman, or degrading treatment or punishment are also guaranteed.Arts. 12 and 14, 2010 Constitution (as amended). The Nigerien Constitution does not address the use of force by the police or other law enforcement agencies. It does, though, observe that national law "establishes the rules concerning" the statute of military personnel, the national gendarmerie, the security forces, and other similar forces.Art. 99, 2010 Constitution (as amended). Niger does not have detailed provisions governing police use of force, and especially the use of firearms, in its domestic laws. A 2011 decree approved the Code of Ethics and Duties of the National Police.Decree No. 2011-164/PCSRD/MIS/D/AR dated 31 March 2011.According to the 2011 Decree, when the law allows the use of force, and in particular, the use of weapons, a police officer must only use force that is strictly necessary and proportionate to the objective sought.Art. 10, Decree No. 2011-164/PCSRD/MIS/D/AR dated 31 March 2011. The use of firearms is partially regulated by a 2014 decree on equipment to be used in public order policing. 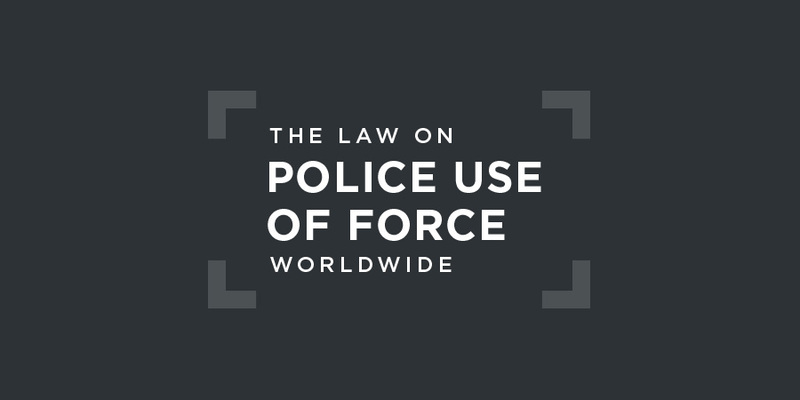 The decree stipulates that in addition to use in self-defence, use of firearms in public order policing must be specifically authorised in accordance with the Penal Code.Art. 7, Décret N°2014-724/PRN/MI/D/AC/R du 26 Novembre 2014.The 2003 Penal Code authorises the use of force, including potentially lethal force, to disperse an unlawful gathering that may disturb public order.Art. 97, 2003 Penal Code.These provisions do not comply with international law. The National Police is under the control of the Ministry of the Interior while the Gendarmerie is under the control of the Ministry of Defence. There is no external police oversight body. Under Article 2 of the Code of Criminal Procedure, the victims or their next of kin have the right to sue for damages in a civil action to obtain compensation for harm resulting from a crime or misdemeanour. The last time Niger went before the Human Rights Committee (which oversees the implementation of the 1966 Covenant on Civil and Political Rights (ICCPR)) was 1993. Following the 2010 coup d'état, the military force responsible for the coup allowed democratic elections to be held in January 2011. Mahamadou Issoufou was voted in as the country’s new President. Niger submitted its initial national report under the Convention against Torture, due in 1999, in June 2018. In the report, Niger does not address the use of firearms, though it does describe sanctions and prosecutions for acts of torture or other inhumane treatment since 1999. There is no caselaw from the African Court on Human and Peoples' Rights on the use of force by the Nigerien police. Niger has reported that the police officers who tortured a student arrested in April 2017 during a demonstration in Niamey were sentenced to two years' imprisonment and order to pay damages to the victim. A prison officer was incarcerated following the use of force that led to the death of a detainee at N'Guigmi remand centre in September 2016. Administrative sanctions were imposed on National Guard agents who inflicted inhumane treatment on a detainee in 2016 at Keita remand centre.